Following on the heels of yesterday’s post from Joe, today’s post covers the cost of healthcare, and what Medicare for All could do to solve it. Recently, two billionaires, Former NY Mayor Michael Bloomberg and former barista-in-chief Howard Schultz have both said that the US cannot afford Medicare for All/Single Payer health care. But if we look at Joe’s article, and his subsequent ones later this week, can we afford not to? This week we are unpacking Single Payer/Medicare for All to better understand the many variations of SP/MFA and now they are different, how those variations might work, and whether some version is a) politically viable and b) would solve the … Continue reading Could Medicare for All Solve the healthcare cost problem? This entry was posted in Cost Control, Cost Shifiting, Costs, employer-sponsored health insurance, Health Care, Health Care Costs, Health Care Spending, medical cost inflation, MEDICAL COSTS, Medicare for All, premiums, Single Payer and tagged Costs, Health Care, Health Care Costs, medical cost inflation, Medical Costs, Medicare for All, Single Payer on February 20, 2019 by Transforming Workers' Comp. The following article from Healthcare Dive is in line with other recent articles on the subject of health care costs and spending. And if that is true, then perhaps going to a more equitable, more inclusive and expanded single payer system that has been proven to provide lower costs and better quality is the right way to fix our expensive and broken health care system. Prices are increasing for the sole purpose of squeezing more and more profit out of a system that should not be guided by supply and demand laws, but rather out of the idea that all citizens need health care at some point, so it should be available to them without having to go bankrupt, or to defer paying bills, or forgoing care altogether. Inpatient utilization dropped, but higher prices increased inpatient spending by 10% between 2013 and 2017. Meanwhile, outpatient surgery prices and higher emergency room use and prices led to more outpatient costs. This entry was posted in Cost Control, Costs, Health Care, Health Care Costs, inpatient utilization, outpatient surgery prices, pricing, Single Payer, utilization and tagged Costs, Health Care, inpatient utilization, outpatient surgery prices, Prices, Single Payer, utilization on February 12, 2019 by Transforming Workers' Comp. What’s Really Wrong With Health Care? The part of the quote up to the word ‘inhuman’ begins the Introduction of a new book I just began reading called, Health Care Under the Knife: Moving Beyond Capitalism for Our Health by Howard Waitzkin and the Working Group on Health Beyond Capitalism, published by Monthly Review Press, the publishing arm of the Monthly Review, an Independent Socialist magazine. Those of you who know me, and those of you who have read many of my previous posts, know that my educational background is in the Social Sciences, as my B.A, is in Political Science and History, with Sociology and African-American Studies thrown in, along with some Humanities coursework. My M.A. is in History, with emphasis on American Social History, especially post-Civil War until the mid to late 20th century. In addition, I also have a Master’s degree in Health Administration (MHA). But what you may not know is that my leanings have been to the far left, and I am still proudly and defiantly so, even if I have tempered my views with age and new insights. I think that is called wisdom. So, as I set out to read this book, much of the material presented in it will not be new to me, but will be perhaps new to many of you, especially those of you who got their education in business schools, and were fed bourgeois nonsense about marketing, branding, and other capitalist terms that are more apropos for selling automobiles and appliances and such, but not for health care, as this book will prove. In this book, there will be terms that many of you will either find annoying, depending on your own personal political leanings, or that you are unfamiliar with. Words such as alienation of labor, commodification, imperialism, neoliberalism, and proletarianization may make some of you see red. So be it. Change will not occur until many of you are shaken out of your lethargy and develop your class consciousness. While the publisher of the book is an independent socialist foundation, it is no means a Marxist or Communist organization. And from my perusal of the names of the contributors to the chapters of the book, I have found that they are all health care professionals or academics, as well as activists. Two of the contributors of one chapter, David Himmelstein and Steffie Woolhandler, are familiar to many in the health care industry, as they have co-authored many peer reviewed articles in health care journals that I have cited in my previous blog posts. Be warned. This book may piss you off. Too bad. The future of health care is at stake, as is the health of every man, woman, and child in the U.S. and around the world. This will probably be true no matter what part of the health care industry you work in. Physicians, insurance company personnel, pharmaceutical company executives, Wall Street investors and money managers, service providers, vendors, consultants and many others will discover inconvenient truths about the businesses that provide their livelihood. As stakeholders in the status quo, you will be resistant to the prescriptions the writers offer for correcting the mistakes of the past, and the recommendations they suggest for the future of health care. This book will not only be relevant to the health care industry, but also to the workers’ compensation and medical travel industries, as each is a subset of health care. And if you do get upset or angry at me for what I have to say about health care, then you are part of the problem as to why health care in the U.S. is broken. Those of you around the world will also learn that your own countries are moving in a direction that sooner or later will result in your health care system mirroring our own, as the authors will point out. This is a book that will shake you to your core. So, sit back, relax, and keep an open mind. It’s about to be blown. The book is divided into five parts, with each part containing at most five chapters, as in Part Five, or two chapters, as in Part Two. Parts Three and Four, each contain four chapters. Part One deals with Social Class and Medical Work, and focuses on doctors as workers, the deprofessionalization and emerging social class position of health professionals, the degradation of medical labor and the meaning of quality in health care, and finally, the political economy of health reform. How have the social-class positions of health workers, both professional and non-professional, changed along with changes in the capitalist global economy? How has the process of health work transformed as control over the means of production and conditions of the workplace has shifted from professionals to corporations? These questions are relevant since medicine has become more corporatized, privatized, and financialized. The author of the second chapter, Matt Anderson, analyzes the “sorry state of U.S. primary care” and critically examines such recently misleading innovations such as the “patient-centered medical home”, “pay for performance”, the electronic medical record, quantified metrics to measure quality including patient satisfaction (“we strive for five”), and conflicts of interest as professional associations and medical schools receive increasing financial support from for-profit corporations. Part One is concludes with Himmelstein and Woolhandler responding to a series of questions put to them by Howard Waitzkin about the changing nature of medical work and how that relates to the struggle for a non-capitalist model of a national health program. Himmelstein and Woolhandler comment on the commodification of health care, the transformation that has occurred during the current stage of capitalism, the changing class position of health professionals, and the impact of computerization and electronic medical records. What are the characteristics of the current “medical industrial complex,” and how have these changed under financialization and deepening monopolization? Are such traditional categories as the private insurance industry and pharmaceutical industry separable from the financial sector? How do the current operations of those industries reflect increasing financialization and investment practices? Once again, Matt Anderson authors the first chapter in Part Two, this time with Robb Burlage, a political economist and activist. Anderson and Burlage analyze the growing similarities and overlaps between the for-profit and so-called not-for-profit sectors in health care, considering especially the conversion of previously not-for-profit corporations such as Blue Cross and Blue Shield to for-profit. The second chapter in Part Two is authored by Joel Lexchin, an emergency care physician and health policy researcher in Canada and analyzes monopoly capital and the pharmaceutical industry from an international perspective. Part Three looks at the relationships between neoliberalism, health care and health. Before I go any further, let me provide the reader with a definition of neoliberalism in case the authors assume that those who read this book understand what it is. According to Wikipedia, Neoliberalism or neo-liberalism refers primarily to the 20th-century resurgence of 19th-century ideas associated with laissez-faire economic liberalism. Those ideas include economic liberalization policies such as privatization, austerity, deregulation, free trade and reductions in government spending in order to increase the role of the private sector in the economy and society. These market-based ideas and the policies they inspired constitute a paradigm shift away from the post-war Keynesian consensus which lasted from 1945 to 1980. These neoliberal policies have been associated in the U.S. with the Republican Party and the Conservative movement since the election of Ronald Reagan. In the UK, the rise of Thatcherism ended the long dominance of the Labor Party’s left-wing until Tony Blair’s New Labor took over. Bill Clinton’s election in the U.S. in 1992, diminished some of these policies, and implemented others such as welfare reform, a goal Republicans had wanted to achieve for decades. What is the impact of neoliberalism on health reforms, in the United States and in other countries? What are the ideological assumptions of health reform proposals and how are they transmitted? What are the effects of economic austerity policies on health reform and what are the eventual impacts on health outcomes? In the next chapter, Howard Waitzkin and Ida Hellander, a leading health policy researcher and activist, trace the history of the Affordable Care Act initially developed by economists in the military during the Vietnam War. International financial institutions, the authors say, especially the World Bank, promoted a boilerplate for neoliberal health care reforms, which focused mainly on privatization of services previously based in the public sector and on shifting trust funds to private for-profit insurance companies. Colombia’s health reform of 1994, Hillary Clinton’s in that year as well, Mitt Romney’s plan in Massachusetts in 2006, which led to the ACA, are examples cited by the authors. The chapter also clarifies the ideological underpinnings of the neoliberal model and shows that the model has failed to improve access and control costs, according to the authors. Economic austerity is closely linked to neoliberalism and have led to drastic cutbacks in health services and public health infrastructure in many countries. As I have recently written in my post, Three Strategies for Improving Social Determinants of Health, economic austerity policies have also affected health outcomes through increased unemployment, food insecurity, unreliable water supplies (Flint, MI), and reduced educational opportunities. Recent teacher protests in West Virginia, Oklahoma and other states are examples of this. 1) constriction of the public-sector health system, 2) retreat from universalism, 3) increased cost sharing, and 4) health system privatization. This trend would seem to have a negative effect on medical travel from Europe and to Europe, as Europe’s health care systems, long touted as a less expensive alternative to medical care in the U.S., begins to suffer. What are the connections among health care, public health, and imperialism, and how have these connections changed as resistance to imperialism has grow in the Global South? The authors are referring to those countries in the Southern hemisphere from Africa, Asia, and Latin America as the Global South. The Global North refers to Europe and North America, and some other industrialized and advanced countries in the Northern hemisphere. The authors in Part Four focus on the forces and institutions that have imposed a top-down reform of health care in the Global South. Such organizations as the Carnegie, Rockefeller, and Gates foundations, the World Bank and International Monetary Fund, trade agreements such as NAFTA, CAFTA, TPP, TiSA, and health organizations as the World Health Organization (WHO) and the Pan American Health Organization (PAHO) are all termed “philanthrocapitalism” by the authors, and have implemented policies that have weakened public health standards and favored private corporations. The final part, Part Five focuses on the road ahead, i.e., the contours of change the authors foresee and the concrete actions that can contribute to a progressive transformation of capitalist health care and society. What examples provide inspiration about resistance to neoliberalism and construction of positive alternative models in the Global South? Because improvements in health do not necessarily follow from improvements in health care, how do we achieve change in the social and environmental determinants of health? How does progressive health and mental health reform address the ambiguous role of the state? What is to be done as Obamacare and its successor or lack of successor under Trump fail in the United States? Howard Waitzkin and Rebeca Jasso-Aguilar analyze a series of popular struggles that focused on the privatization of health services in El Salvador, water in Bolivia, as well as the ongoing struggle to expand public health services in Mexico. These struggles are activities David and Rebeca participated in during the past decade. These scenarios demonstrate an image of diminishing tolerance among the world’s people for the imperial public health policies of the Global North and a demand for public health systems grounded in solidarity rather than profit. In the U.S., the road ahead will involve intensified organizing to achieve the single-payer model of a national health program, one that will provide universal access and control costs by eliminating or reducing administrative waste, profiteering, and corporate control. 1) the rise of for-profit managed care organizations (MCOs); 2) the emergence of high-deductible (“consumer-directed”) health insurance, and 3) the entrenchment of corporate ownership. The authors offer a critique of Obamacare, explain and demystify innovations as Accountable Care Organizations, the consolidation and integration of health systems, something yours truly has discussed in earlier posts as they relate to workers’ comp, and the increasing share of costs for patients. The next two chapters concern overcoming pathological normalcy and confronting the social and environmental determinants of health, respectively. Carl Ratner argues, that mental health under capitalism entails “pathological normalcy.” Day-to-day economic insecurities, violence, and lack of social solidarity generates a kind of false consciousness in which disoriented mental processes become a necessary facet of survival, and emotional health becomes a deviant and marginalized condition. Such conditions of life as a polluted natural environment, a corrupt political system, an unequal hierarchy of social stratification, an unjust criminal justice system, violent living conditions due to access of guns, dangerous working conditions, and so forth, Ratner dissects as the well-known crises of our age in terms of the pathologies that have become seen as normal conditions of life. Next, Muntaner and evolutionary biologist Rob Wallace show how social and environmental conditions have become more important determinants of health than access to care. They emphasize struggles that confront social determinants through changes in broad societal polices, analyze some key environmental determinants of health including unsafe water (Flint again), capitalist agribusiness practices, and deforestation in addition to climate change. And they refer to the impact these have on emergent and re-emergent infectious diseases such as Ebola, Zika and yellow fever. a sustained, broad-based movement for a single-payer national health program that assures universal access to care and drastically reduces the role of corporations and private profit, 2) an activated labor movement that this time includes a well-organized sub-movement of health professionals such as physicians, whose deteriorated social-class position and proletarianized conditions of medical practice have made them ripe for activism and change, 3) more emphasis on local and regional organizing at the level of communal organizations…and attempted in multiple countries as a central component in the revolutionary process of moving “beyond capital”, and 4) carefully confronting the role of political parties while recognizing the importance of labor or otherwise leftist parties in every country that has constructed a national health program, and understanding that the importance of party building goes far beyond electoral campaigns to more fundamental social transformation. In their book, the authors try to answer key and previously unresolved questions and to offer some guidance on strategy and political action in the years ahead. They aim to inform future struggles for the transformation of capitalist societies, as well as the progressive reconstruction of health services and public health systems in the post-capitalist world. Throughout this review, I have attempted to highlight the strengths of the book by touching upon some of the key points in each chapter. If there is a weakness to the book, it is that despite the impressive credentials of the authors, they like many other authors of left-of-center books, cling to an economic determinism as part of their analysis, which is based on theories that are more than one hundred years old. As I stated in the beginning of this review, my views have been tempered by examining and incorporating other theories into my consciousness. One theory that is missing here is Spiral Dynamics. Spiral Dynamics is a bio-psycho-social model of human and social development. It was developed by bringing together the field of developmental psychology with evolutionary psychology and combines them with biology and sociology. In Spiral Dynamics, biology is concerned with the development of the pathways of the brain as the adult human moves from lower order thinking to higher order thinking. The social aspect is concerned with the organizational structure formed at each stage along the spiral. 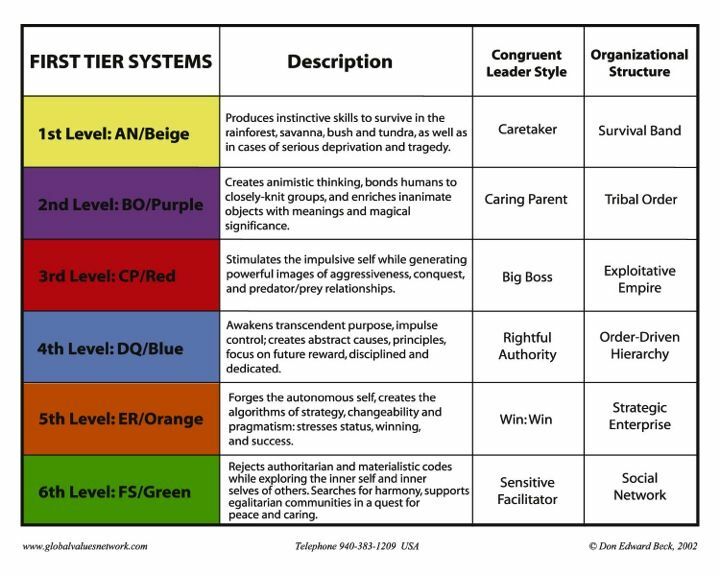 For example, when an individual or a society is at the Beige vMeme, or Archaic level, their organization structure is survival bands, as seen in the figure below. At the Purple vMeme, or Mythic level, the organizational structure is tribal, and so on. There is, among the authors of the book, an evolutionary biologist, but it is not clear if he is familiar with this theory and what it can bring into the discussion at hand. It would not only benefit the authors, but also the readers to acquaint themselves of this valuable theory which would present an even more cogent argument for better health care. As the book concludes with a look at the future of health care after capitalism, knowing the vMemes or levels beyond current levels will enhance the struggle. As I continue reading the book, I hope to gain greater insight into the problems with privatized, corporatized, free-market capitalist health care. My writings to date in my blog has given me some understanding of the issues, but I hope that the authors will further my understanding. I believe that anyone who truly wants to see the U.S. follow other Western nations who have created a national health program, whether they are politicians like Bernie Sanders, his supporters, progressives, liberals, and yes, even some conservatives who in light of the numerous attempts to repeal and replace the ACA, have recognized that the only option left is single-payer. Even some business leaders have come out and said so. I recommend this book to all health care professionals, business persons, labor leaders, politicians, and voters interested in moving beyond capital and realizing truly universal health care and lower costs. This entry was posted in ACA, Access to care, ACO, Affordable Care Act, Africa, Capitalism, Cost Control, Electronic Health Records, financialization, Global North, Greece, Health Care, Health Care Costs, Health Care Reform, Health Insurance, Health Policy, Insurance, libertarianism, MEDICAL COSTS, Medical Tourism, Medical Travel, medical-industrial complex, mental health, Mexico, Monopoly, NAFTA, Neoliberalism, outcome measures, Outcomes, physicians, Population Health, private insurance, progressives, Quality, Quality Measures, reform, Republicans, Single Payer, Social determinants of health, socialism, Spiral Dynamics, TISA, TPP, Trade Agreements, Trump, United Kingdom, vMEMES, Workers' Comp, Workers' Compensation, Zika and tagged ACA, Affordable Care Act, Capitalism, commodification, economic determinants of health, environmental determinants of health, Europe, financialization, Global North, Global South, Greece, Health Care, Health Care Costs, imperialism, Medical Costs, Medical Tourism, Medical Travel, medical-industrial complex, Mexico, Neoliberalism, Obama, Obamacare, pharmaceutical industry, physicians, private insurance, privatization, proletarianization, Single Payer, Social determinants of health, social-class position, Spain, Spiral Dynamics, Trump, U.S., UK, vMEMES, Workers' Comp, Workers' Compensation on April 9, 2018 by Transforming Workers' Comp. Many of you have probably thought that going abroad for medical care after passage of ACA was a thing of the past, or that the idea that workers injured on the job would go abroad was a “stupid, ridiculous idea and a non-starter”, have forgotten that medical care in the US is the most expensive in the world. But the simple, undeniable fact is that we spend too much on medical care and get very poor results and outcomes, while other countries spend far less and get better outcomes. Why are we so stubborn? And why hasn’t the workers’ comp world realized that they are fighting an uphill battle to lower costs every time they come out with some new strategy or cost containment measure that never lives up to its promise industry-wide? Sure, there are individual cases where these companies save money for a particular client, but overall, the cost of medical care for workers’ comp still rises, even if that rise is slow at times, or appears to have shrunk, only to rise once again the next year, as seen in the NCCI State of the Line reports. An article yesterday in Salon.com said that traveling abroad for medical care simply makes more sense — even regular teeth cleaning is four times more expensive in the US than it is in Mexico. One of the first procedures mentioned in the article involves a Minnesota couple who went out of the country for an in-vitro fertilization (IVF) procedure. On her fourth trip to the Czech Republic, it finally worked, and she got pregnant. The procedure in the US would have cost them between $12,000 and $15,000. 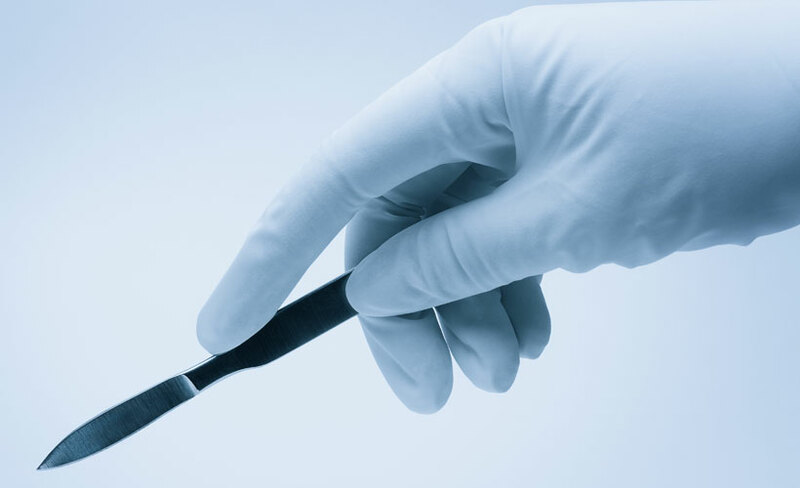 While IVF is not something that workers’ comp would cover, the fact remains that procedures cost far too much in the US, and in the case of IVF, only have a 29% success rate, according to a CNBC report cited in the article. An estimated 1.7 million Americans traveled abroad for care in 2017, according the Josef Woodman, CEO of Patients Beyond Borders, and author of the same titled book. In my seven years of studying medical travel, Josef Woodman’s name has figured prominently in many articles and forums of discussion on the subject. The article goes on to say that that is 10 times more than the 2008 estimate from Time magazine. Some of the top destinations for medical care are: India, Israel (always go to a Jewish doctor first), Malaysia, Thailand, Taiwan, South Korea (unless that little twerp up north gets an itchy trigger finger), and Turkey. However, there are other, more accessible destinations closer to home like Mexico, Costa Rica, Panama, etc. Typical operations are orthopedic or spine surgery (are you listening work comp world? ), reproductive operations, cardiovascular and eye surgery. For example, a coronary artery bypass graft (CABG) in the US costs an estimated $92,000 (you could buy a couple of nice cars for that amount), whereas in India, the same operation would cost $9,800. A total knee replacement (are you still listening ,workers’ compsters?) cost around $31,000 in the good ole US of A, but in Thailand, costs around $13,000. Tell me how you can save that much on a knee replacement using any of your so-called cost saving schemes? These same operations in Costa Rica would cost 45 to 65% less than in the US, and would not require such long flights from most parts of the US. What are you waiting for? Save some money, I guarantee your insureds will love you for it. Malaysia would be 60 to 80% less, but why go there when you can go to Costa Rica? According to Woodman, medical tourism (travel) is a Band-Aid for the country’s dysfunctional health care system. Woodman also said he did not like the term “medical tourism” because it is not a vacation. You may have noticed that I use the term “medical travel” instead. It is travel for medical purposes, and if there is tourism component to it, it is incidental to the reason for going in the first place. Patients who cannot afford dental work, IVF or orthopedic surgery in the US, Woodman said, should consider travelling abroad. If their operation or treatment is expected to cost them $6,000 out of pocket, they will save money — even with the plane ticket. Oh, by the way, that Minnesota couple spent, get this, only $235 for the IVF, not including flights. With such reasonable cost savings, it would be a no-brainer for workers’ comp to do the same. But some people are stupid, ridiculous, and non-starters in my book. This entry was posted in ACA, Back surgery, Cardiac care, Cost Control, Costa Rica, Cross-border Health Care, Dental Care, Global Health Care Services, Health Care, Health Care Costs, India, Injured workers, Knee Replacement, Malaysia, Medical Tourism, Medical Travel, Mexico, Orthopedics, South Korea, Thailand, Turkey, Workers' Comp, Workers' Compensation and tagged ACA, Affordable Care Act, Costa Rica, Cross-Border Health Care, Globalization, Health Care, Health Care Costs, Medical Tourism, Medical Travel, Mexico, Workers' Comp, Workers' Compensation on March 6, 2018 by Transforming Workers' Comp. This entry was posted in Access to care, Cost Control, Europe, Health Care Costs, Hip replacement, MEDICAL COSTS, Spain and tagged Costs, Europe, France, Health Care Costs, Hip Replacement, Medical Costs, Spain, United States on August 4, 2017 by Transforming Workers' Comp. Once again, we have to look at the issue of opt-out. This time in the land of Lincoln. Yet, it seems that Capital is still trying to stick it to Labor by dismantling the workers’ comp state systems. Stephanie Goldberg, writing yesterday in Business Insurance, reported that the Illinois Policy Institute, an organization the Republican Governor, Bruce Rauner, has previously donated to, issued a report last month calling for “updates” [Emphasis added] to the state’s more than 100-year-old system. He acknowledged that it is difficult to reform the system because there are so many stakeholders (a point made by myself and others). On the one hand, what the report is stating makes sense, and seems to agree with the idea of opening up the system to new ways of providing care to injured workers, but if we look deeper at the alleged success of opt-out in Texas, Oklahoma, and the failure to get it passed in Tennessee and South Carolina, we find that the proponents of opt-out have not been very up front and honest on the subject. What they really want is to blow up the entire workers’ comp system nationwide, and take us back to before Triangle, a point they seem to be making quite successfully in some quarters of the work comp industry because of the apolitical and ahistorical atmosphere in which this issue is often discussed. We recently lost one brave soul who fought the temptation to drink the kool-aid on opt-out, and we cannot let his memory pass without remembering that he was not fully convinced that opt-out had proved itself. In my last post, I mentioned what happens to closed systems if they do not change. With opt-out, we would not be seeing an opening of the system that still offers protections to injured workers, albeit with more options and more flexibility, but rather a complete and utter destruction of the entire system, which is what ARAWC and the Illinois Policy Institute wants, so that the employer is the one who benefits, not the employee. Mark Adams stated that the system they have looks like it deals with the 19th Century, and not with telecommuters, or people who balance caring for a child, an elderly relative, and work responsibilities. True, but going back to the 19th Century when workers had to sue for benefits, if they were lucky to get to court, is not the answer. One reason why opt-out has not been successful outside of Texas and Oklahoma, is as Stephanie Goldberg, says, the potential for constitutional challenges to opt-out laws could give pause to states considering legislation, as what happened in February when the Oklahoma Workers’ Compensation Commission ruled that provisions of the state’s Employee Injury Benefit Act deprive workers of equal protection and access to the courts, and to unfairly allow employers to define “injury.” The Supreme Court in Oklahoma is reviewing the case. One wonders what the old railsplitter would think about the idea to deprive Labor of its rights to equal protection and access to courts, and to benefits they deserve when injured on the job. Lincoln would be horrified to learn that Capital has become superior to Labor. This entry was posted in ARAWC, Benefits, Capitalism, Constitutionality, Cost Control, Employees, Employers, Illinois, Injured workers, Medical Tourism, Medical Travel, Oklahoma, Opt-out, South Carolina, Tennessee, Texas, Workers' Comp, Workers' Compensation and tagged ARAWC, Constitutionality, Employees, Employers, Illinois, Illinois Policy Institute, Medical Tourism, Medical Travel, Oklahoma, Opt-Out, South Carolina, Tennessee, Texas, Workers' Comp, Workers' Compensation on August 4, 2016 by Transforming Workers' Comp.